Matt Heintz is a research engineer in the Deep Submergence Lab at Woods Hole Oceanographic Institution (WHOI). He started his career at WHOI as a pilot for the human-occupied submersible Alvin. 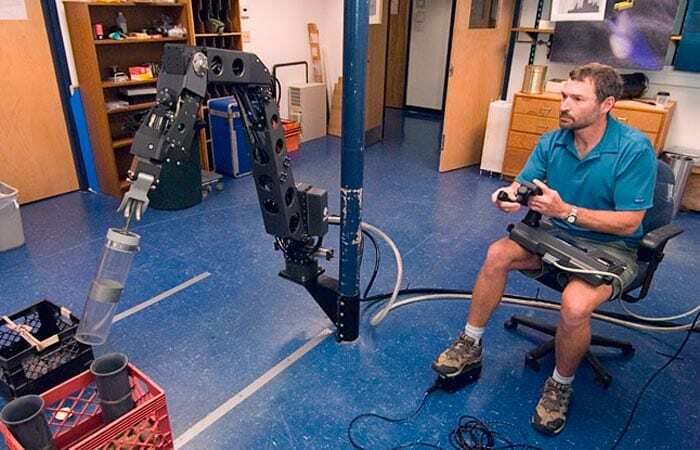 In 1999, he began developing the second iteration of the remotely operated vehicle Jason. Both of those vehicles use manipulator arms to collect samples and measurements on the seafloor. Heintz was responsible for developing a hydraulic power unit, sampling apparatus, and a manipulator arm with “good kinematics,” or ranges of motion, for WHOI’s newest deep-sea vehicle Nereus. Oceanus: Tell us a little about your arm—well, not your arm, Nereus’s arm. Heintz: It’s a seven-function, hydraulically powered, master-slave manipulator. It has shoulder elevation, shoulder rotate, elbow, wrist pitch, wrist yaw, wrist rotate, and wrist grip. Oceanus: Whoa! And for those of us in the audience who aren’t engineers? Heintz: It is an attempt to be similar to the human arm, but obviously, it is a bit more clunky. It moves a little slower, although surprisingly fast. We have a “master” control arm on the surface ship that we move, and then a subsea “slave” arm mimics what the master does. Oceanus: What jobs do you do with the manipulator arm? Heintz: We pick up rocks, collect water samples, take temperature measurements, and collect biological samples, which means opening and closing sample boxes or moving around a scoop or a net. We also take push cores—that is, pushing cylindrical tubes into the seafloor to take sediment samples, as well as position and manipulate instruments on the seafloor. Oceanus: What were some of the biggest engineering challenges you faced to design the arm? Heintz: We had to think a lot about power and pressure. Nereusis powered entirely on batteries. There is no power going down the fiber tether. So the big issue we faced was: Would we have the kinematic versatility to perform a myriad of tasks that scientists like to do—and do it without eating all the energy that the vehicle has in ten minutes of operating the arm? Manipulator arms typically use quite a bit of power. 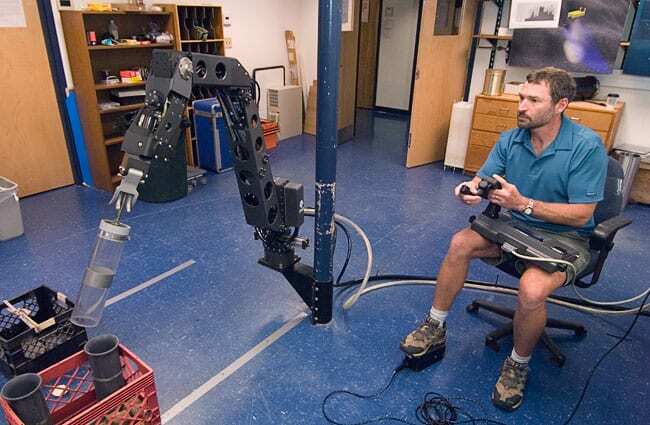 We designed our own in-house hydraulic-power unit, or HPU, and developed this manipulator arm in parallel to be more energy-efficient than other hydraulic manipulator systems. Oceanus: Can you explain how a hydraulic-power unit works? Heintz: In the hydraulic system, oil is the blood. It is the fluid that forces joints to move in the manipulator. A gear pump forces the oil to create pressure to move the manipulator. Each of the joints in the arm is rack-and-pinion, which means you move just enough oil to make it move the arm, and then the oil stops moving. Other rotary joints have a lot of leakage that wastes one to two horsepower just by turning them on. But in our hydraulic system, there is no leakage, so the motor stalls until the arm begins to move—saving power. Oceanus: What brand of oil do you use? Heintz: Actually, one of the problems that we have with the manipulator at great depth is that oil gets compressed by the pressure. The oil becomes much thicker as the pressure is increased. Effectively, it turns into molasses. So one of my big fears was that when we got down there, the oil would be too thick, and the manipulator would be too sluggish to get any work done. You could drive thick oil by dumping more energy into the pump, but that would kill our batteries too fast. Oceanus: What did you do? Heintz:First we determined how thick of an oil the manipulator and HPU could operate with. We bought an oil that is as thin as you can possibly get. On deck, it’s almost like water. Then we calculated how thick this oil would get at eleven kilometers depth. The manipulator does not fit into our pressure test chamber, so we tested the manipulator in the lab with an oil that is thicker than the oil would be at eleven kilometers. And we ran the hydraulic power unit in our pressure test facilities with that thin oil and calculated how much more power was required to operate the HPU at eleven kilometers compared to on deck. Oceanus: What other unforeseen issues came up? Heintz: Another thing we had to look at very closely is, when you’re on the seafloor working, you’re not just sitting there. So, for instance, if we’re trying to push a core into the seafloor, and there’s no external force holding the vehicle in position, the core won’t go in. The vehicle will just be pushed away. We need to use the thrusters to hold position when we’re sampling, so we had to take into account how much power we needed to hold position. That really drove us to a fast, easy-to-operate, and capable manipulator arm, because if it takes forty minutes to do a push core because the manipulator has poor kinematics, and we’re using all that power holding position for forty minutes, well, that is going to ruin mission endurance. It wasn’t immediately obvious when we started the project that we had to have that kind of speed and capability. When we analyzed all the mission scenarios, we really realized how important it was for the arm to be able to do things quickly. Oceanus: How did you go about building the arm? Heintz: We hired an outside firm, Kraft TeleRobotics, which developed hydraulic manipulator arms that have been used on Alvin and Jason. We looked at some designs for arms, and we sent them a wish list. There was an iterative process and several visits. We showed them things they could do to save weight, and we modeled various lengths of the various joints on the manipulator and discussed with the manufacturer how we could lengthen that one there, for instance, to make it a little better. We worked with them to make a custom arm for Nereus. So there is only one of these arms. Oceanus: How did the arm turn out in terms of capabilities? Heintz: It can pick up about thirty-six pounds, and it is quite dexterous. And most importantly, it is capable of performing the tasks that we’ll be asked to do with Nereus. 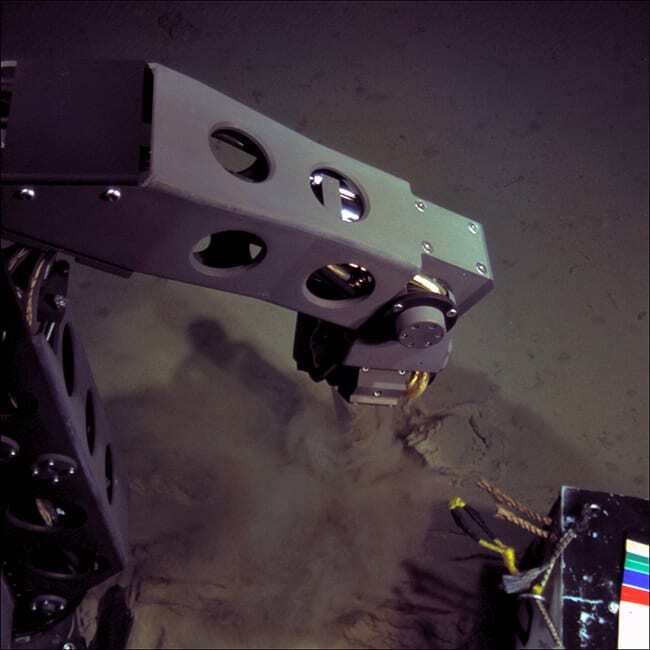 It really becomes practice and the skill of the pilot to be very careful to gently close the manipulator jaw on samples without crushing them. You control the arm visually—basically by stopping the jaw at the right time. There are three cameras on the vehicle at different angles, and one can triangulate the camera views and quickly piece together where the arm is. Oceanus: Are there any other special features about Nereus’s arm you’d like to mention? Heintz: Well, one big difference with Nereus is that it has that tiny little light fiber tether that breaks at eight pounds, and if we lose that, we lose telemetry—that is, our communications link with the vehicle. If for instance, we were sampling a rock and we lost telemetry, Nereus would be attached to the seafloor. We don’t want to stay attached to the seafloor. But the hydraulics are still there. There is no reason that the arm can’t let go. It just doesn’t know to let go, because it no longer can talk to the operator up on the surface. So we program the software that controls the manipulator to know that if we lose telemetry, to let go of whatever it is holding and to shut off hydraulics. Now there are other circumstances. What if the arm is holding a $150,000 scientific instrument? Well, we don’t want to lose that $150,000 instrument, so before that operation, we would program the arm to not let go, in the event we lose telemetry. Oceanus: That’s cool. Those are things people don’t think about. Heintz:Well, we have a lot of smart people here whose job it is to think about these problems.